A temple near home recently underwent some serious renovation and they certainly up the ante at the scale level, particularly with the erection of various statues of a pantheon of deities normally worshipped by those practicing Taoism/Confucianism. Some of them are about the height of 2-3 storeys building! 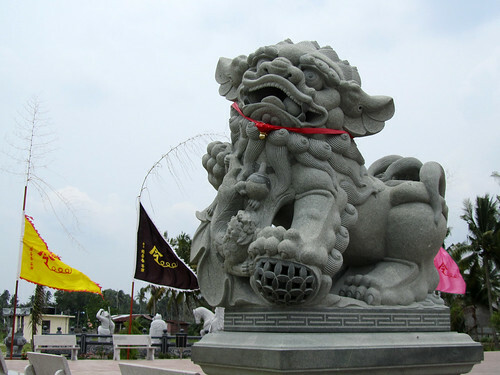 They also added some traditional decorative elements, such as this guardian temple lion, at the gate to the square of deities. The lions always come in pair, usually one with mouth open and one with mouth shut. They are signs of courage and strength, and protection against bad luck and evil. I am simply drawn to the playful nature depicted by this lion, that life is free of worry and there are bundles of good in the world.